A renowned and award-winning poet, playwright and performer from Manchester, Louise Wallwein has made a name for herself as an explosive artist that detonates her audiences’ imaginations. Louise was brought up in 13 different children’s homes and wrote her first play at the age of 17. Her career took off in 1998 when she performed an award-winning one-woman show on the wing of a world war 2 Shackleton reconnaissance aircraft and her various experiences as a cleaner, club promoter and dancer at the Hacienda and activist for organisations such as anti clause 28 and Viraj Mendis defence campaign have undoubtedly shaped her. Among many writing residencies, Louise was the 2006 Poet in Residence in Queensland and Writer in Residence at the University of Manitoba Winnipeg, Canada. Her plays have been broadcast by the BBC, graced the stage of Sydney Opera House, Royal Exchange and Contact Manchester. GLUE, her acclaimed, theatre demolishing one-woman show is currently on tour. 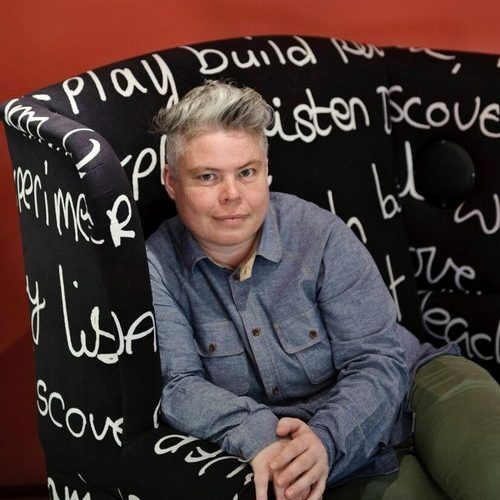 Louise is under commission with National Theatre Wales and B.B.C Radio 4 and is one of the Hull 17 Poets in residence. Louise has made 20 films with young people around the UK, working for Bolton at Home, Home Manchester and UCLAN. Fall won Best Film at the BFI Awards 2015.